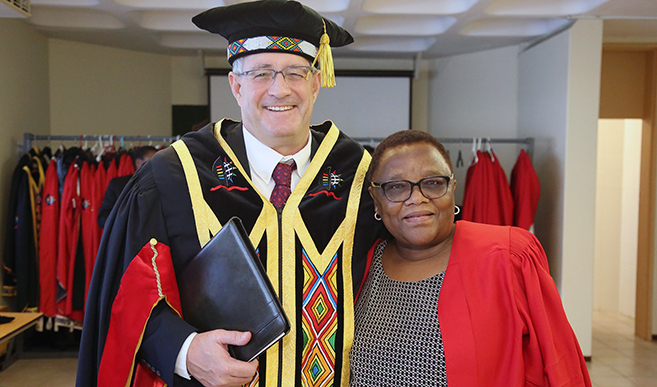 Nyokong, who was presented with a Doctor of Science at the University’s Graduation ceremony, said she was honoured to receive the distinction and join the body of proud alumni at one of South Africa’s top universities. ‘I think it is still very rare for scientists to be recognised in this manner. I am used to seeing poets and musicians being honoured in this way, so I am delighted,’ she said. Nyokong holds a Department of Science and Technology (DST) and National Research Foundation (NRF) professorship in Medicinal Chemistry and Nanotechnology at Rhodes University, as well as a rare A-rating from the NRF. Nyokong spent time in Lesotho as a child where time at school was interspersed with shepherding duties. Inspired by nature and initially inclined toward the arts, during her high school years she decided to pursue the sciences, developing a passion for chemistry. She continued her tertiary studies in chemistry at the National University of Lesotho (NUL), and attended McMaster University and the University of Western Ontario on a Canadian International Development Agency Scholarship, where she received her Master’s and PhD degrees respectively in the late 1980s. She then went on to hold a Fulbright Fellowship for post-doctoral study in the United States. Nyokong returned to Africa to teach at NUL, before joining Rhodes University in 1992 where she quickly ascended to the position of full professor and established a renowned research laboratory, now featuring advanced equipment loaned by the National Laser Centre, and equipment funded by the NRF and Mintek. In this laboratory, she pioneered photodynamic therapy methodology, a chemotherapy alternative with fewer side effects involving use of the harmless dye giving blue denim its colour. The dye initiates cancer cell death after activation with a red laser beam. She has also contributed to the fabrication of molecular sensors for environmental, biological and medical applications. Nyokong’s list of accolades is long and illustrious, and includes an Adjunct Professorship in Norway, a registered patent, more than eight books and book chapters, 670 refereed journal publications and recognition by the NRF as one of the top three publishing scientists in South Africa. She has served as editor and on editorial boards of renowned international journals and was awarded the Third World Academy of Science (TWAS) medal in 2013 for her outstanding contribution to science and technology. She holds numerous honorary doctorates in science, is a Fellow of the Royal Society of Chemistry and the TWAS, a member of the Academy of Science of South Africa, and was named by the National Centre for Research on Human Evolution, Spain, as one of 12 names likely to change the world. She was one of the first South African scientists to win the L’Oréal-UNESCO award for women in science in 2009 in the Physical Sciences category. She calls this one of her most life-changing awards, as it increased her international visibility and put African science on the world map. As a result, she influenced science and technology policy in Africa, addressing ministers of science and technology and young researchers across the continent. She was also appointed by former United Nations (UN) Secretary-General, Ban Ki-moon, to the UN Secretary-General’s high-level panel on technology bank for least developed countries, and was invited by Irina Bokova, Director-General of UNESCO, to be a member of the UNESCO High-level panel on Science, Technology and Innovation for Sustainable Development. Another milestone award was the Kwame Nkrumah Scientific Award from the African Union, which afforded her the opportunity to address African heads of states.